Given a decimal number as input, we need to write a program to convert the given decimal number into equivalent binary number. Store the remainder when the number is divided by 2 in an array. Repeat the above two steps until the number is greater than zero. Print the array in reverse order now. If the binary number is 10. Step 1: Remainder when 10 is divided by 2 is zero. Therefore, arr = 0. Step 2: Divide 10 by 2. New number is 10/2 = 5. Step 3: Remainder when 5 is divided by 2 is 1. Therefore, arr = 1. Step 4: Divide 5 by 2. New number is 5/2 = 2. Step 5: Remainder when 2 is divided by 2 is zero. Therefore, arr = 0. Step 6: Divide 2 by 2. New number is 2/2 = 1. Step 7: Remainder when 1 is divided by 2 is 1. Therefore, arr = 1. Step 8: Divide 1 by 2. New number is 1/2 = 0. Step 9: Since number becomes = 0. Print the array in reverse order. Therefore the equivalent binary number is 1010. 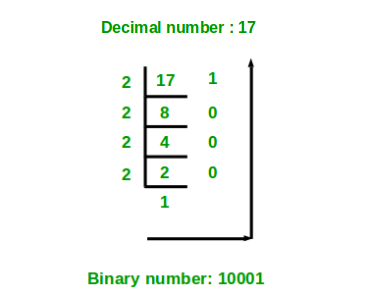 Below diagram shows an example of converting the decimal number 17 to equivalent binary number. We can use bitwise operators to do above job. Note that bitwise operators work faster than arithmetic operators used above. Thanks to ajay0007 for suggesting above solution.